I’ve been anticipating the Summer Solstice this year so that I could visit the Solstice Snake (aka Solar Snake or Hyper Viper) and watch the arrowhead of light appear on the snake’s head. 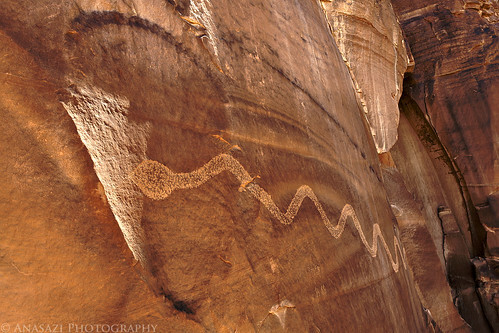 For about two minutes on the summer solstice a dagger of light shaped like an arrowhead appears on the head of this very large and well executed petroglyph of a snake near Moab. It was an amazing experience! I spent much of the beginning of the year researching this petroglyph and searching for it. Once I found it, it was just a matter of waiting for the short window of time to get this image. My time and efforts seem to have payed off!